Please find below a poster and self-explained email from the Secretary of Qatar Hockey Federation. 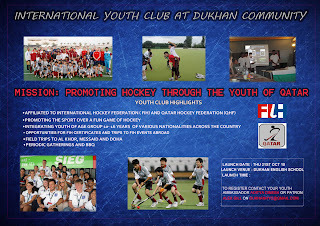 The objective of the program is to promote youths to play Hockey and participate in Youth Club. I would very much appreciate if you kindly forward to other Malaysians in your dawlah Al-Khor and Ad-Dukhan. 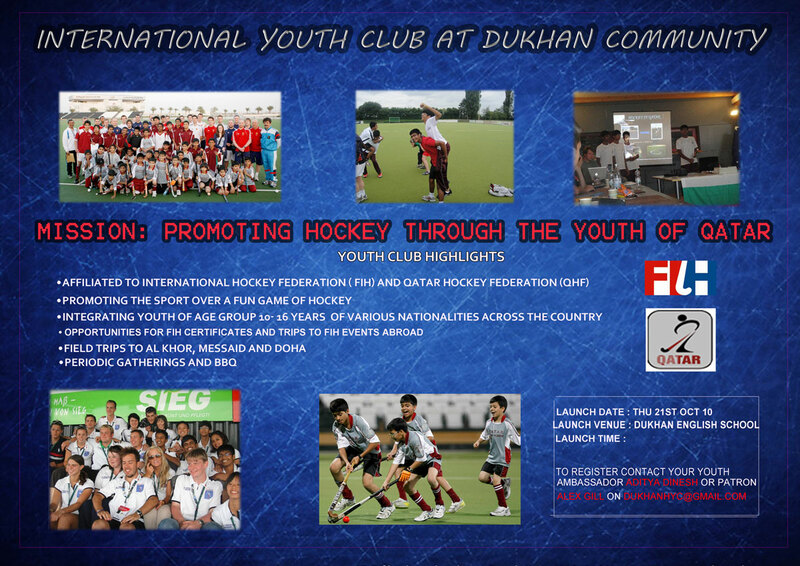 Please see revised poster of the Launch of the Dukhan Youth Club next Thursday - 21st October tentatively at 5.30 PM. Request you will pass it around and take it as a personal invitation to be present and support the youngsters. Doha, Al Khor and Messaid units will soon be launched. No single nationality should constitute more than 33% of the whole unit.. This is an effort of the Kids so please do encourage it. The poster was designed by Varun who is the Youth Ambassador from Doha. Please tell people you know who may be interested in registering their kids.